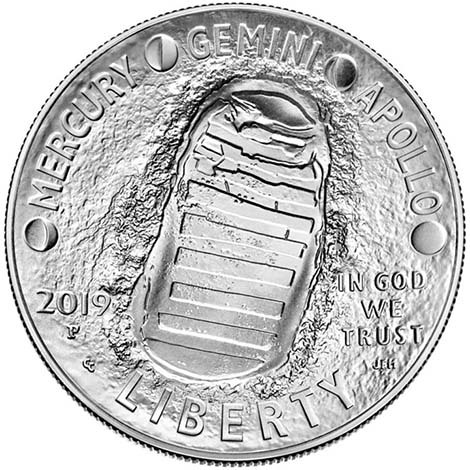 The coins will be released in January to celebrate the 50th anniversary of the moon landing. 2019 Apollo 11 5oz Silver Dollar that he struck at the event. 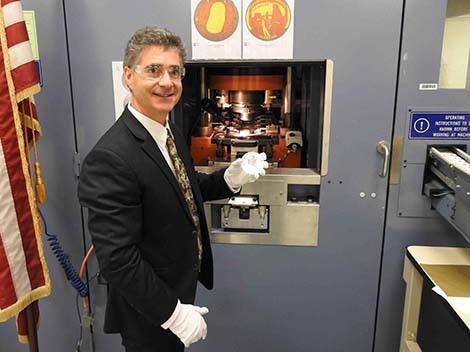 David J. Camire, NCS President and NGC Finalizer, was among the dignitaries to attend the "First Strike" ceremony for the 2019 Apollo 11 commemorative coins. 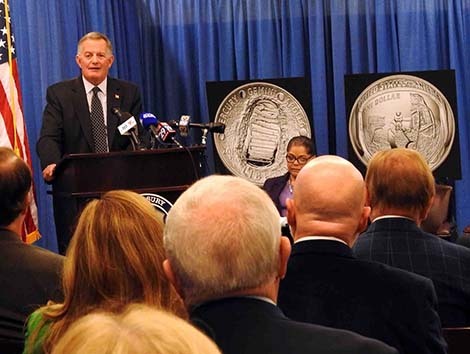 The ceremony was held at the US Mint in Philadelphia on December 13, 2018. The coins are being released January 24, 2019 as the 50th anniversary of the historic Apollo 11 moon landing mission approaches. 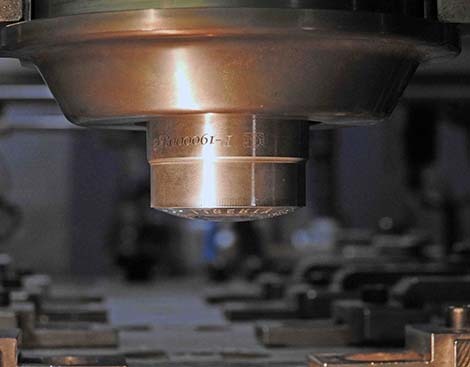 All coins in the new program will be curved – that is, domed on one side and bowl-shaped on the other. 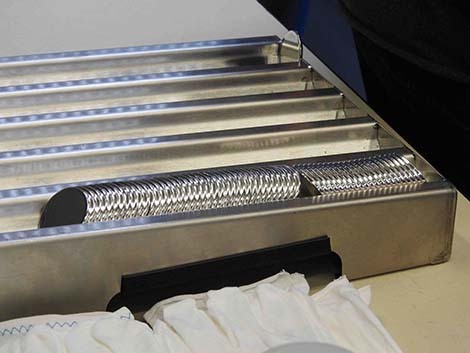 This is only the second time that the US Mint has made curved coins; the first was in 2014 for the National Baseball Hall of Fame commemoratives. All coins feature the same design. 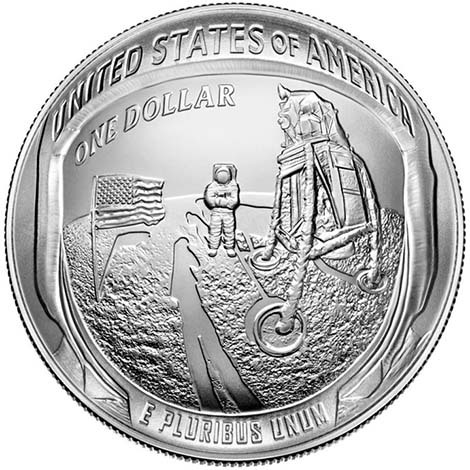 The obverse, which is concave, features the iconic image of Buzz Aldrin's footprint on the lunar surface. Also included are the names of the NASA programs that led to the moon landing: Mercury, Gemini and Apollo. The reverse is a re-creation of an iconic photograph showing Neil Armstrong, the Apollo 11 lander and the US flag, all reflected in the visor of Buzz Aldrin's helmet. Children of the three Apollo 11 astronauts (Neil Armstrong, Buzz Aldrin and Michael Collins) were also present at the First Strike ceremony. Other VIPs included David Ryder, US Mint Director; Jeff DeWit, NASA Chief Financial Officer; Christopher Browne, Deputy Director of the Smithsonian National Air and Space Museum; Sheryl Chaffee, Vice Chair of the Astronauts Memorial Foundation; Curtis Brown, Chairman of the Astronaut Scholarship Foundation Board of Directors; and Ron Harringal, manager of the US Mint's Design and Engravers division. US Mint Director David Ryder speaks during the First Strike event. A row of silver dollar planchets ready for striking. The domed surface of the obverse die is apparent in this close-up. 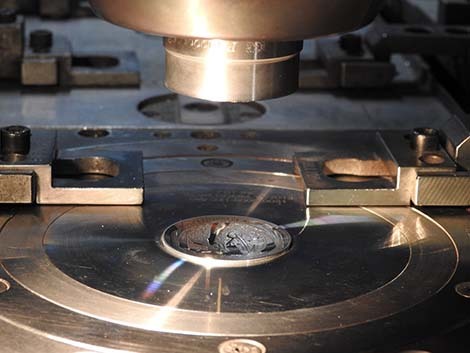 A view of the reverse die (bottom) with obverse die above.